And it's Ladbrokes sports, William Hill, and Coral nose to nose over the finish line! But Ladbroke's won by a whisker! What an incredible race. Ladbroke's is one of the Big Three bookies in the UK, and has over 2200 betting shops in the UK, Belgium, and Ireland. Ladbroke's covers practically every sporting event, with main markets displayed down the left side of the website/app, including football, horseracing, greyhounds, tennis, cricket, and golf. Hit the A-Z button for a complete list of events. 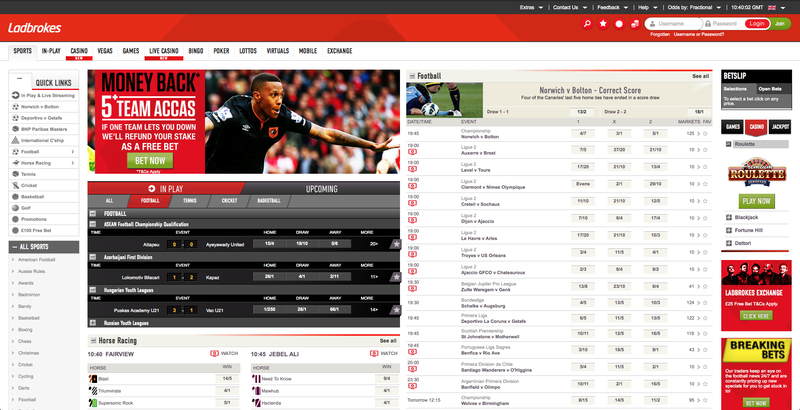 Ladbroke's isn't the most attractive of sportsbook sites, and the red and white colour scheme gives it the appearance of a downmarket tabloid newspaper. Still, you'll find everything you need, along with links to Vegas, casino, lotto, poker, bingo, and virtuals. The software itself is smoother than a nag's nose, so don't let the appearance put you off, unless you are a stickler for aesthetics. I use Ladbroke's on my laptop, iPhone, and iPad as well – there's no lag time whatsoever, which makes it perfect for the gamer on the move. Live scores and past results are accessible through various systems, including recent win and loss stats from teams and individual players, and horses and jockeys. Check the TurfTrax section for up-to-the-minute information on horses in each race. There is live audio commentary for numerous events, but this mainly covers horse racing, greyhounds, and football. Thousands of events are streamed live on Ladbroke's TV. Want some cheeky inside information? Then get clued up on Pick of the Pundits news section, and you never know, it could help you back a big winner. Main events are covered on the homepage in a chatty tabloid format – I find this friendly engagement of players a real plus side of the site – it really makes me feel like they're on my side. High rollers will be at home Ladbroke's – there are incredibly high betting limits, which makes it the ultimate destination for big sporting events. The company was founded in 1886, and is now based in Harrow, London. Between 1999 and 2006, Ladbroke's owned the Hilton hotel brand, and is listed on the London Stock Exchange. This heritage means incredible piece of mind – you don't have to worry if your payout will come in full, and on time. If you prefer your bookmakers to have roots in the real world, then Ladbroke's is a safe bet. This app has a nifty customisable home screen. You can either customise it for football, or horseracing – just toggle which you prefer on the menu. 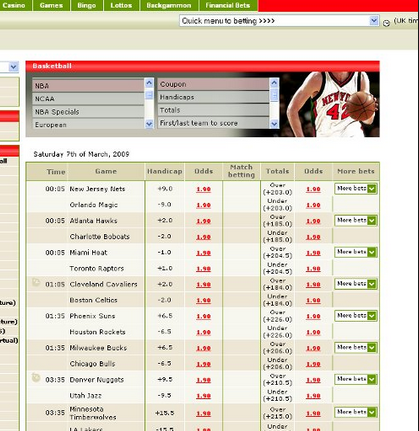 You can also access your 10 year betting history. The site loses points for the intrusive live chat window that pops up repeatedly. Check the promotions pags for the latest offers and current welcome bonuses. Ladbroke's is a member of the European Sports Security Association. Via an irritating live chat window, email, post, and telephone. With so many ways to access Ladbroke's, it could be easy to get carried away. Never gamble in secret, never bet more than you can afford, and never view gambling as a way to make money. If you think that you're developing a problem, click the Gamble Aware link at the bottom of the Ladbroke's page.